An example of the Richland County Sheriff&#39;s Office&#39;s new biometric scanning technology. 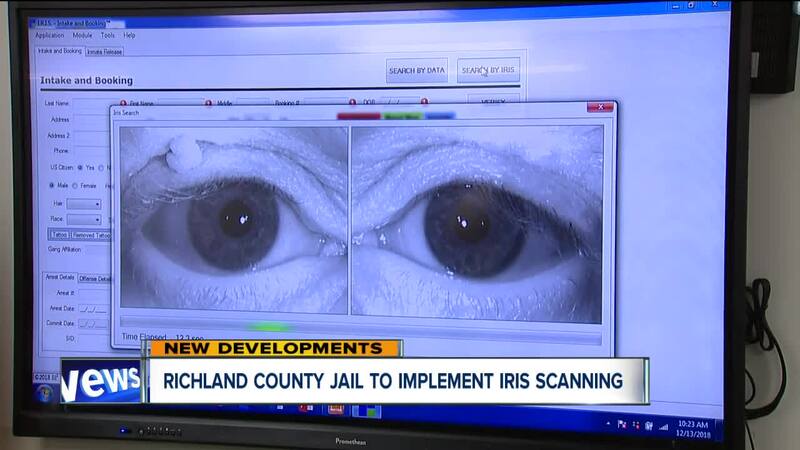 The Richland County Sheriff’s Office is now the first in the state to implement “biometric iris technology” to identify offenders. The technology uses a special camera to capture a photo of an offender’s eye or eyes and uses the unique pattern of the iris to identify the person. It takes about seven seconds, according to Sean Mullin, creator of BI2 Technologies . “But that’s not the only strength, the other strength is that it’s more hygienic, the individual simply looks at a digital camera from about 15 inches away,” Mullin said. He added that there is nothing more reliable or quicker when it comes to identification. After a scan, if a person is already in the database, it takes about seven seconds to reveal their identity. Richland County Sheriff Steve Sheldon said it is another crime fighting tool in their tool belt. In the last 10 years, Sheldon said two inmates have been released from the jail due to giving a false identity. This technology, he said, will ensure that offenders are identified quickly and accurately. According to Mullin, the iris has about 770 unique features, while a fingerprint contains roughly 90 unique features. The biometric iris scanning will not replace fingerprinting, which is not only used for identity but forensics. It will be used in conjunction with fingerprinting and mugshots as a way to ensure an offender’s identity. The iris scan will only be used on offenders who have already been arrested and placed into a local and national database that sheriff’s departments in 47 other states already use. There are about 1.4 million iris identities in the database -- compared to tens of millions of fingerprints. It costs nearly $9,000 per year for the technology and software, according to Mullin.